Once you’ve decided on a format and focus for your podcast, it's time to get down to some nitty-gritty: Figuring out how you’re going to capture the audio. That means choosing a microphone (and maybe other hardware) and recording software. It means figuring out a recording workflow. And, if you’re going to include guests who can’t be in the same room with you, you have to know how you’re going to record them. Here’s how four podcasting vets—Christopher Breen (the Macworld Podcast); Editorial Director Jason Snell (The Incomparable); Erika Ensign (Verity! ); and Chip Sudderth (The Two-Minute Time Lord)—capture their audio. More frequently, though, he hosts the podcast from his own home, and all participants record themselves remotely. In his home office, he uses a vintage AKG 414 microphone with pop filter on a standing boom stand connected to an Apogee One USB interface. He used to use in-ear headphones, but found them uncomfortable and switched to the Sony V6s. For remote guests, he uses Ecamm Network’s Call Recorder to capture Skype tracks. He likes the way it places his voice on one track and the rest of the speakers’ voices on another; you can then split those tracks using tools supplied with the application. Macworld staffers have developed a way to pipe Skype tracks into GarageBand. At the same time, however, he has guests record their side of the conversation and then send their track to him. The audio quality is always better than with Skype, and those separate files provide more mixing options. She says that the Blue Snowball USB mic is the “official mic of Doctor Who podcasters”. (It doesn’t hurt that “they look like little Ood translator balls.”) So when she started Verity!, she encouraged her cohosts to invest in Snowballs; eventually, they all complied. Everyone records into their own mics in their own location—preferably the quietest room they can find. As most of her cohosts are technophobes, Ensign selected software that was both free and easy for all them to use. After testing a few free recorder apps, she settled on Audacity. That’s also a common choice in the Doctor-Who podcasting community, so there are lots of people to ask for technical assistance when required. Ensign has a professional background in tech writing, so she assembled a how-to document covering the steps necessary to recording and exporting MP3 files. When it comes time to record, she hosts a Skype call with everyone. She first talks them through a “pre-flight checklist”: wear your headphones, turn them down as far as you can while still being able to hear, open Audacity, make sure the correct mic is showing as the input. She then does a count-down and everyone presses the Record button in Audacity at roughly the same time. (This makes for easier syncing later.) Everyone records her own track, which the others then send to her via Dropbox. While she’s recording, she keeps a notebook handy; if she hears anything egregious in the background (traffic, thumping, chattering children), she notes the time code so she can mute it later. She also records the Skype call itself in case there’s a problem with someone’s file. She used the free Amolto Call Recorder for Skype for a while, but has now switched to the equally free MP3 Skype Recorder. Both run on her Dell laptop. For the first 150 episodes of his podcast (he’s now up to 185), “it was very low-tech”: He recorded while sitting in bed, eventually adding a tripod on the floor so he didn’t have to cradle the microphone on his stomach. That microphone was initially a Blue Snowball, but he’s switched to a Blue Yeti. He says the Yeti sounds better and has a headphone jack, which allows him to hear not only his own voice, but also the audio from his computer with everyone else’s, too. He’s recently set up office space in his garage, where that mic is now attached to his desk by a boom arm. The rooms in his house aren’t particularly echoey, so he doesn’t do anything like surround the microphones with sound-absorbing foam (something other podcasters do). He, too, uses Skype to record the other participants. But everybody on the other end also records his or her end of the conversation. 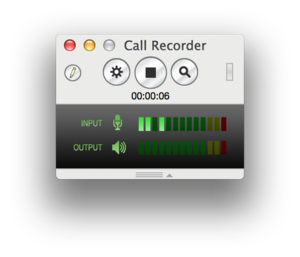 Many of them use Ecamm’s Call Recorder, but even that isn’t really necessary: On the Mac, QuickTime Player will let you record an audio file directly. (Choose New Audio Recording, select your mic, and press the big red button; there are basic equivalents on Windows, if you’re talking to somebody who’s using a PC.) Everyone then sends him his or her recorded files; he also records the Skype call. Chip, too, uses a Blue Yeti mic. (He says it’s warmer, more forgiving and less noisy than the Snowball.) The Yeti Pro includes XLR inputs, which he occasionally uses with his remote recording device, the Zoom H4N. If he’s recording off-site, he uses either the built-in mics on the H4N or carries a lighter, phantom-powered condenser mic. He records with Audacity. He, too, uses Skype for remote guests. (“I always hold my breath when a new OS X or Skype release emerges,” he says, because that so often breaks the software.) As long as guests have decent bandwidth and microphones (“at least a Blue Snowball”), he finds captured Skype audio to be adequate. He doesn’t sweat the audio quality that much, as long as there are no echoes, no interference, and no drop-outs.